All transactions are safe and secure with a reliable history in online purchasing behind each of our associates. 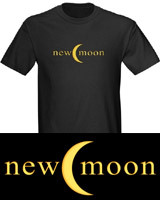 Buy the New Moon Crescent Logo t-shirt to own New Moon clothing and merchandise. If your friend jumped off a bridge, would you do it too? Well, Bella probably would but we can't blame her. Life-threatening acts like cliff diving do seem more appealing when it results in hearing voices from your long lost love. In a desperate attempt to have contact with Edward, Bella takes up cliff diving at La Push beach with Jacob Black and his Quileute friends. Order this New Moon logo tee with a werewolf La Push t-shirt to celebrate Bella's daring adventures. Wear it to play Twilight board games. In addition to the New Moon Crescent Logo tee above, browse the New Moon Clothing Gallery for more apparel like men's and women's clothes, kids shirts or hoodies.